Stiebel Eltron Tempra. The Tempra® series has been redesigned completely inside and out – upgraded heavy-duty electronics, a simple single flow sensor design, a hinged cover for easy access, and Tempra Advanced Flow Control™ for the Tempra® Plus. Welcome to the next generation of German quality. 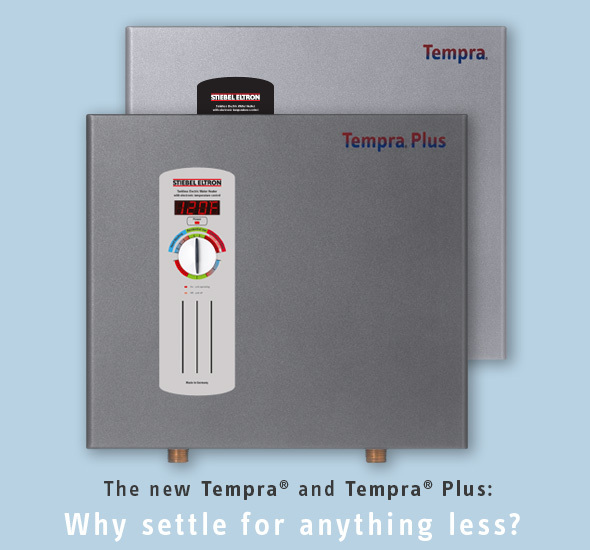 The Tempra® has several advantages over a gas-type tankless water heater. Compared to many similar gas tankless models the Tempra® is less expensive to purchase. Installation is also much simpler and cheaper since it is not necessary to vent a Tempra® to the outside. The venting that a gas unit requires causes anywhere from a 10 – 20% efficiency reduction from heat escaping out the exhaust pipe. Furthermore, for every cubic foot of gas burned, roughly two cubic feet of air have to be mixed in to create ideal combustion. In a cold climate, this hurts efficiency further. When a gas unit fires it draws in air around it, heats the water, and then expels warm exhaust outside. Since no house is airtight, this suction action causes a drafting condition where cold air from the outside seeps back in through door cracks and other parts of the house that may not be airtight. By nature of the design, the Tempra® is nearly 100% efficient; converting 100% of the electrical energy it consumes into heat. All that heat is then transferred to the water – none is lost to the outdoors.